WBA welterweight champion Lucas “La Maquina” Matthysse 39-4 (36) has arrived in Malaysia with a clear message for world title challenger Manny “Pac-Man” Pacquiao 59-7-2 (38): it’s going to be war. Shortly after stepping off the plane following a lengthy 18-hour flight across the Pacific Ocean, the 35-year-old champion and his team headed for the gym to knock out some rounds and shake off some jetlag. But the Argentine knockout artist had just one thing on his mind. “Manny Pacquiao. I want to defeat a legendary fighter like Manny. This is not Judah, Alexander, Postol or Garcia,” said the bearded and heavily tattooed Matthysse, who travelled with his manager Mario Arano, trainer Joel Diaz and Golden Boy Promotions PR specialist Ramiro Gonzalez. 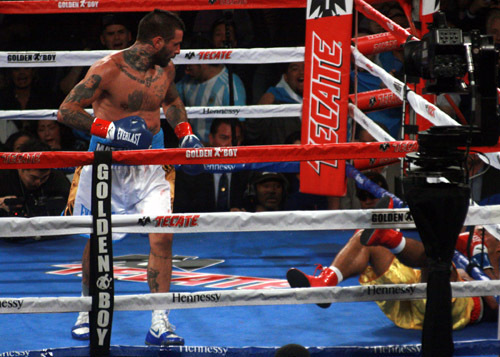 Matthysse will have 10 days to overcome his jetlag ahead of arguably the biggest challenge of his career. “This is Manny Pacquiao and this is the quest for anyone on boxing,” he said. The fight was up in the air as recently as last week as news emerged that MP Promotions had failed to meet a number of their financial obligations. Those issues have since been resolved and the card will proceed as planned, according to MP Promotions. Meanwhile only 70 percent of tickets for the “Fight of Champions” have been sold as of yesterday, with the promoters planning discounts to help move the remaining 30 percent. “The VVIP and VIP tickets have already been sold out, while the platinum tickets are almost sold out. With about 10 days to go, we hope we can sell the remaining tickets by offering special discounts,” said MP Promotions business head Arnold Vegafria at a media conference. “This will be one of the biggest fights in Asia as both are champions and are aggressive fighters,” he continued. One of the more interesting aspects of this fight is the move by Pacquiao to sack his trainer of 15 years Freddie Roach and replace him with lifelong friend Buboy Fernandez, who has headed up the training camp for the first time. Matthysse versus Pacquiao will top a big card at the Axiata Arena in Kuala Lumpur, Malaysia on July 15 that will also feature a further three world title fights. In a battle of southpaws Filipino Jhack Tepora 21-0 (16) will face Edivaldo Ortega 26-1-1 (12) of Mexico for the interim WBA featherweight title. South African Moruti Mthalane 35-2 (24) will clash with Pakistan-born South Korean-based Muhammad Waseem 8-0 (6) for the vacant IBF flyweight title. Meanwhile, Venezuelan Carlos Canizales 20-0-1 (16) will be making the first defence of his WBA junior flyweight title against Bin Lu 1-0 (1) of China.